I think we can neutralize this pseudocontext by simply deleting the context. 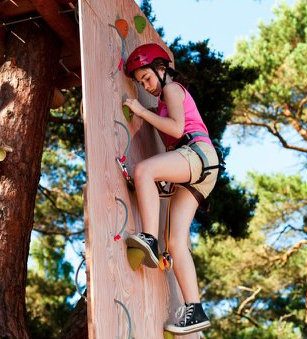 Delete the rock wall and we delete the lie that rock climbers are concerned with quadrilaterals while simultaneously preserving a task with a lot of admirable qualities. Which quadrilaterals can you locate in this grid? Can you find a trapezoid? How do you know it’s a trapezoid? Show a neighbor. 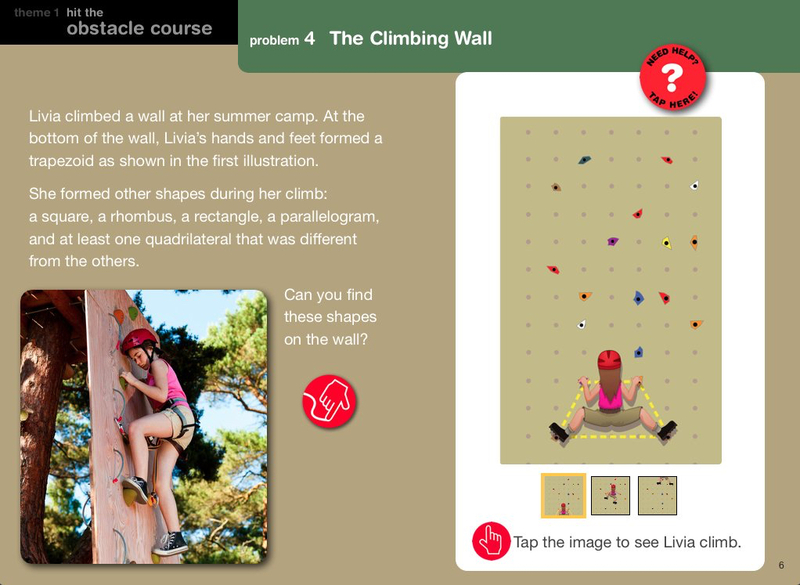 For whatever it’s worth, if there were some way to help Livia climb the wall by communicating with her through quadrilaterals, I’d re-evaluate this entire post. Because I’m afraid of heights, I would assume that the question would be a quadratics question about how long it would take her to hit the ground when she falls and the person holding the belay rope drops it. This stuff is always so brain-shatteringly bad. I know it’s bad, I just never realize how bad it is. I think he’s daring us to believe that two rock climbing pictures could both be about quadrilaterals. So, by 10s. Obvious neither are an obvious fit, and my first idea would would be that climbing the wall at different speeds would relate to counting by 10s and 100s. However, I think it’s actually getting at the quadrilaterals made by the girl’s hands and feet. I have to admit, that’s a good way of coming up with irregular quads (although most will be convex). 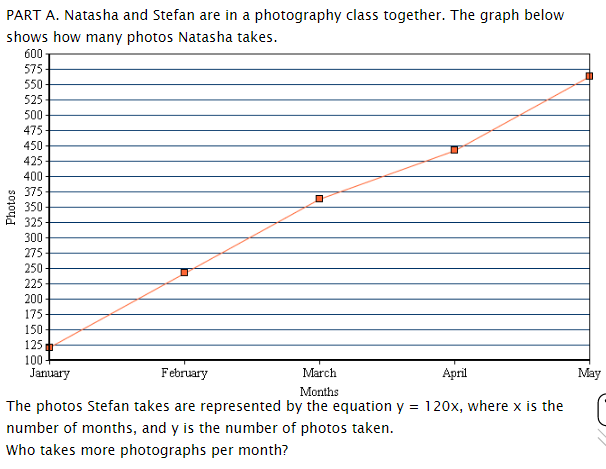 But, if I’m right, this illustrates the pseudo-context: my first question was different than what it’s asking! I have no idea what the textbook is trying to portray. Regardless of the answer it is another example of textbook writers trying to force mathematics into a situation that is not appropriate or necessary. These types of problems are one of the reasons students do not buy into the impact of math in our world. I think this one doesn’t qualify based on this line in the rules: “It’s an image that implicitly or explicitly claims that “this is how we use math in the world!”” I don’t see that implication anywhere in this problem. The picture is a frame, not a lie. I’m not saying this is the best example of this type of thing, but it feels more like it’s trying to be something like Function Carnival or Water Line on Desmos than the typically egregious pseudocontext we often see on these. Does the Cannon Man care what the graph of his trajectory looks like? No. And Function Carnival doesn’t claim he should or does, but then, this doesn’t actually claim that Livia cares either. It just says “Hey look! Patterns!” This seems like an attempt to use a harmless frame to gain interest through flashiness and cuteness, but then hold it by having an honestly compelling problem to do within the frame. 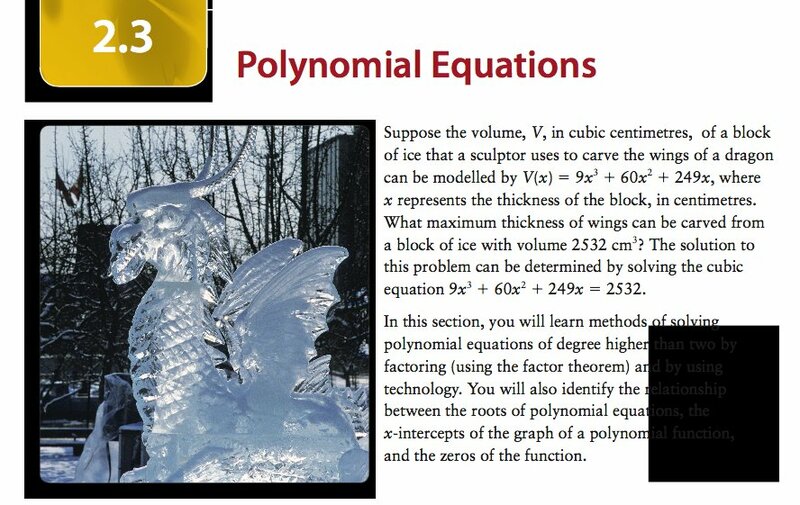 I hate bad examples of modeling that textbooks pretend qualify as good modeling, like that terrible ice sculpture question. A lot of pseudocontext falls in that category. I don’t mind problems like this, though. For some students, those cute pictures might be enough to start the engagement that a plain grid with dots on it wouldn’t provide. I know some of those students, in fact. The problem isn’t pretending to be a 3 act and doing badly at it. At worst it’s saying “If you look for quadrilaterals in weird places, you might find them,” which doesn’t strike me as a wrong or harmful thing to say at all. It reminds me a little of a CPM Geometry problem I’ve defended in the past, which starts “Marcos was walking home after school thinking about special angle relationships when he happened to notice a pattern of parallelogram tiles on the wall.” and then proceeds to use an intuition of parallelogram properties to realize that corresponding angles are congruent. I love that problem, even though everybody in my class is like “Marcos is a little weird, huh?” The context doesn’t matter. It doesn’t necessarily add anything to the math. But it humanizes the problem, and gives a frame for the investigation. Does it increase engagement? In my experience, yes. Some students are more interested in figuring out what Marcos was thinking than they are the math itself. And the rest of us can just laugh at it good-naturedly – which itself elevates the mood of the classroom. And it allows me to ask them to look for quadrilateral patterns in walls themselves – bring me pictures and I’ll put them on the wall! I like to flip these and think about whether there are any questions that make the context less pseudo. This one might even be interesting actual context about quadrilaterals. Since you have four points of attachment to the wall (usually), your body does form a quadrilateral. Most of them will not be “interesting” quadrilaterals. But there are constraints on them imposed by your torso, arm, and leg length. Is there some relationship between those three things and the sorts of quadrilaterals that a person can climb? Maybe some relationship in perimeter? Or minimum interior angle? This experiment seems like the old game Balderdash where you make up definitions for obscure words. The crazier the definitions get the harder it is to pick the correct answer. I think you have been letting us off easy the last few weeks. Only 2 choices. We might just be getting lucky! The criteria is–it unnecessarily muddies the already murky water. Abstracting information is not only the most difficult part of mathematical thinking but also one of the most important. Imagine a student who is beginning to make the connections between the concrete and the abstract, and the light is starting to illuminate the helpfulness of abstraction and mathematical constructs. Enter a pseudo-contextual problem, and you can turn a student who thought they were getting it into another person who thinks maths is confusing and non-sensical. Given this, I think this one qualifies as pseudo-context. As maths teachers, I think we need to leave these “puzzle-type” contexts for poorly crafted mind-bending games. We have a hard enough time teaching mathematical thinking; we don’t need to make it even more difficult by having to correct the errors created by poor constructed problems. I have been recently been reading the book “Five Practices,” and this reminds me a lot about their step 0 practice–selecting the appropriate problem. Given the idea that you would want students be able to identify different quadrilaterals and understand their attributes, this would not be the problem that I would select.